ASIA FRUIT LOGISTICA is Asia’s leading trade show for the international fresh fruit and vegetable business. ASIA FRUIT LOGISTICA 2014 attracted more than 1,800 top decision-makers from 64 countries to Hong Kong. Exhibitor numbers increased by 25% to 478 companies from 38 countries. 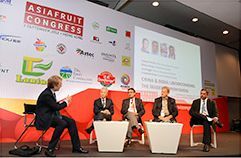 Congress and exhibition are the only trade events in Asia focused on the fresh fruit and vegetable business covering the whole. Hong Kong in September 2015 is the place to be if you want to make your mark in Asia!